A bedroom is your personal sanctuary. It is your personal and private space where you retreat to refresh yourself. It is also the place where you can be completely yourself without any pretense or artifice. Industrial design is a style that appreciates the visual appeal that lies within utilitarian objects. It boldly exposes the raw beauty of the building materials to achieve a raw, edgy, and original style. Industrial design adds a raw, unfinished look to the most thoughtfully designed homes. Also, it selects elements that are as much about function as style. Therefore, industrial bedroom design is the perfect style for your bedroom interiors design. This design is a popular trend increasingly used to style loft and warehouse apartments, commercial spaces, and even modern homes. In the late 2000s, the demand for converting industrial places like warehouses and factories into urban living spaces started increasing. This certainly led to the popularity of the Industrial design style. The Industrial look is based on combining the best aspects of old-world charm with modern sleekness. It also has an amazing ability to achieve aesthetic balance by juxtaposing sleek and modern with vintage and classic. Its main feature is to turn structural elements into showpieces to achieve an unfinished, yet cohesive and chic look. Stripped-bare architecture, metal, stone, and wood surfaces, and neutral tones are also some features of this style. Here are some of the most striking and edgy industrial design ideas to get this industrial charm in your home. The soothing colors and warm interiors of this cozy bedroom certainly relax the mind. The weathered and exposed ceiling and concrete floors give the room an industrial look. The low bed, stylish side table, and industrial lamps further add to this look. The bed and the area rug bring colors, texture, and patterns into the design. The warm white colors of the walls and bedspread make the room look warm and welcoming. So much of industrial decor is about contrast. The old with new, recycled next to DIY and even light beside dark. This bedroom combines the neutral, slightly raw look of bare white brick with a stark black accent wall to create contrast, dimension, and depth. If plain brick walls feel too cold for your tastes, you can also experiment with this bold alternative. The white walls, along with the white bed and bedspread, give the room a bright and spacious look. In contrast, the black accent wall maintains the balance of light and gives character to the decor. Instead of exposed bricks, a wooden wall panel is the main feature of this design. It also works as an accent wall and brings, pattern and visual interest to the decor. Hardwood floors and metal-framed windows give an industrial touch to the design. The industrial table lamps and oversized dome pendant ceiling light further adds to the industrial look. However, the cozy bed and area rug, as well as the potted plants, give the decor a homely and warm feel. Exposed pipes and ducts are other common traits of the industrial design style. So are concrete walls and floors, and metal framed windows. This bedroom too celebrated the raw edgy beauty of these elements by highlighting them with lighting. However, the furnishings of this bedroom give it a softer look despite its industrial character. The industrial decor elements like the metal laundry box or stylish table also add an industrial touch to the decor. Many people often mistake Industrial design as a dull and drab design. The truth, however, is far too different. 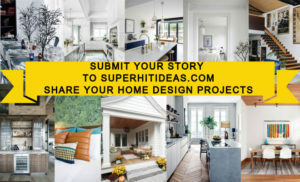 You can make this design as cheerful or as moody as you want. For example, the bright yellow walls of this bedroom take nothing away from its industrial character. In fact, they highlight the black industrial staircase, the metal balustrade, industrial light, and the low platform bed. The carpeted floors and colorful bedsheets give the room a warm and playful vibe. Industrial design is not just about raw edges and unfinished look. It is also about beautiful contrasts and highlighting the imperfections of the decor. The shabby chic design of this Industrial bedroom is the perfect example. The light color scheme, beautifully patterned carpet, plush bedspread, soft pillows, and stylish mirror soften the raw edgy look of the room. Also, the weathered walls and exposed pipes add character to the design. The cozy lighting and light colors give the room a cheerful and inviting look. All in all, this bedroom showcases understated industrial elegance at its very best! Who said there’s nothing glamorous about exposed brick walls? This luxurious bedroom will not only prove them wrong but also make them take back their words! The shiny finish on the hardwood ceiling and floors, metal column, framed windows, and exposed beams, all make the rough elegance of the exposed brick wall even more pronounced. The use of curtains gives the otherwise bright room a moody and dark look. In contrast, the plush bed and throw along with pillows make the room look warm and welcoming. The industrial lamps and the use of exposed pipes to add lighting gives the room a distinctly industrial feel. However, it is the unusual yet interesting industrial wall art that steals the show in this bedroom. This industrial bedroom design is a study in contrasts. The dark walls of the bedroom, as well as the dark curtains, give it a moody and dark look. In contrast, the bleached flooring, large windows, and white bedspread make the room look light and airy. The industrial style floor lamp, as well as the open shelf beside the bed, further add to the industrial appeal of this bedroom. The open design of this small room also gives an illusion of space. Moreover, the subtle grouping of furnishings separates the bedroom from the living space. 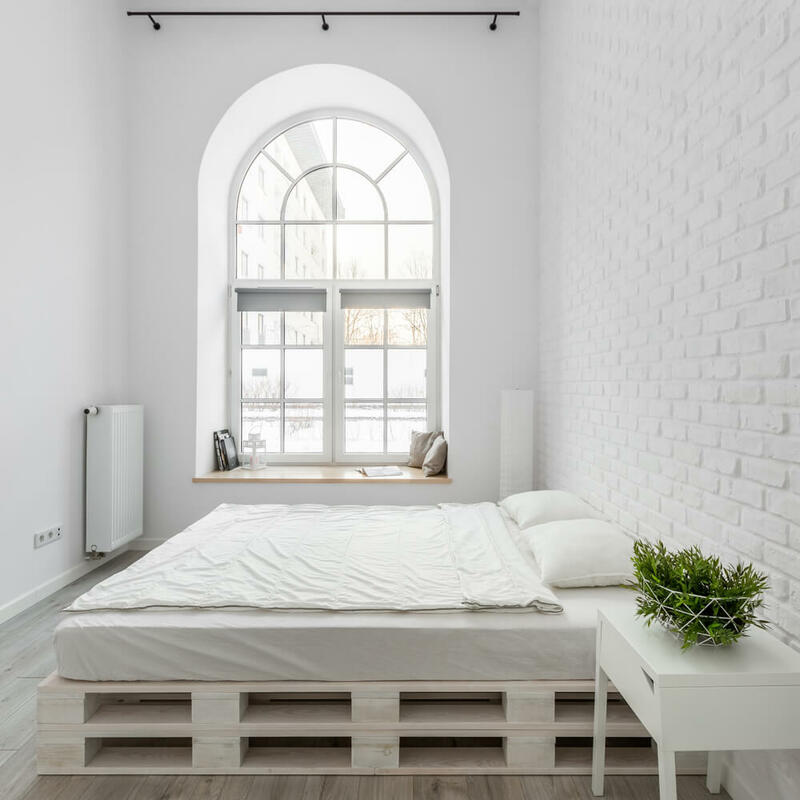 This all-white industrial bedroom design is the latest trend in interior designing. The subtle elegance and serenity of this look are increasingly getting converts all over the world. Instead of the raw unfinished look of the exposed red bricks, this look offers a sleek edge with its white finish. The industrial design celebrates engineering and the ingenuity of mechanics. One of its distinctive features is a wooden pallet bed like the one used here. This one is bleached white to go with the white tones of the walls, ceilings, furniture…Well, you get the idea. Even though exposed wooden beams, hardwood floors, and industrial lighting give this room a raw, unfinished look, the soft colors of the decor give it a softer touch. The comfortable upholstered bed and plush bedspread bring warmth to the decor. The cozy throw, stylish lamps, and glamorous pink pillows give the room a sophisticated chic look. Despite the industrial design, the subtle elegance in the decor gives this room a soft and comfortable feel. Industrial bedroom design does not necessarily mean industrial lighting and building materials. When done correctly, the treatment of a room decor can also give an industrial look. Take this bedroom for example. Despite the stone floors, metal-framed windows, and a wooden platform bed, it is the treatment and aesthetic of the decor that gives it the industrial feel. The natural light makes the room look airy and spacious. Also, the spackled pallet wall art and hand-painted Morrocan pendant lights bring warmth to the decor. Exposed brick walls, ceiling beams, exposed pipes, and wooden floors give this bedroom an industrial look. The harsh edgy look is softened with a comfortable bed, soft pillows, an area rug, and a cozy throw. The capitone design headboard gives the room a classy and elegant touch. The pendant light from Mohr and McPherson, the purple flowers, the wall art, and the woven bench add a playful and colorful look to the decor. Exposed beams, industrial light fixtures, and functional furnishing make this room an industrial bedroom design. The white walls, large windows with curtains, white bedspread, and area rug brighten the room and make it look spacious and airy. In contrast, the dark tones of the bed, side tables, and cupboards maintain the balance of light. The open shelves for storage add some interest to the simple design. The green lamps, pillows, and throw bring a splash of color to the design. They soften the look of the room and bring comfort to the decor. The green, white and brown bedroom design looks warm and welcoming. The wooden accent wall in this elegant bedroom makes a bold statement. The concrete walls, wooden floorboards, exposed pipes, and industrial light fixtures give this room an industrial feel. However, the cozy bedspread, area rug, pillows, sheepskin rug, throw, and pouf soften the look of the room and make it warmer and inviting. The oval mirrors, neutral color palette, and modern furniture give the room a sophisticated and elegant look. The obvious contrast between colors and the splash of yellow in this bedroom’s decor gives it a playful and fun vibe. The grey accent wall gives the room an industrial touch. The black bedspread, wall art, floor lamp, and bicycle all have yellow details making them pop against the dark tones of the wall. The yellow and grey knitted poufs and ikat print area rug brings pattern, color, and texture to the decor. The potted plant softens and brightens the room making it look more homely and warm. The industrial design of this loft makes the studio even more welcoming. The open design encourages more time together. It also gives the small space a light, spacious, and airy feel. The neutral color palette brings warmth to the decor. The industrial bunk beds with railings give a feeling of security. They also save a lot of space. This beautiful industrial bedroom design is elegant and graceful. The exposed pipes, beams, and tiled accent wall give the room an industrial touch. The glass and wood closet further adds to the industrial look. The platform bed and wooden side tables with their dark tones bring contrast to the decor. The colorful bedspread and pillows bring a splash of color to the decor. The green flowers soften the decor and bring a fresh and warm feel to the decor. the stunning Cirrus ceiling fan is a classic industrial addition to the decor. This simple bedroom is the perfect example of industrial minimalism. Stone floors, concrete walls, and ceiling are typical of industrial design. The recessed ceiling lights and hanging pendant lamp bring a modern touch to the decor. Similarly, the raised platform bed is a minimal decor classic. The large window with blinds lets in plenty of natural light with an option for less light when needed. No other furnishings or decorative items adorn this simple room. The neutral color palette gives the room a calm and peaceful feel.